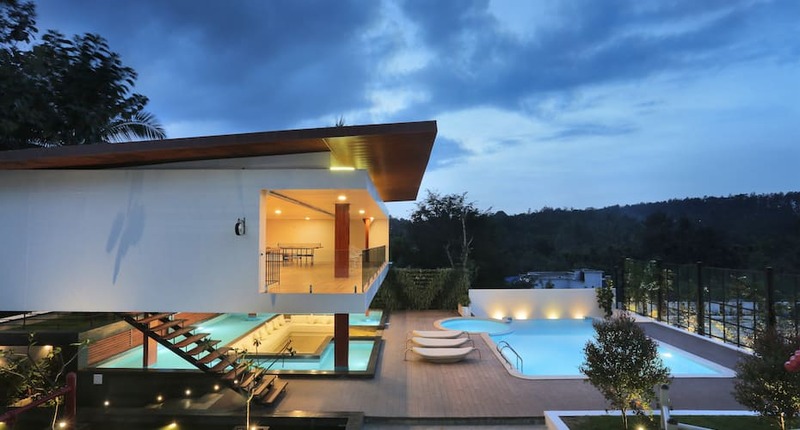 Get pampered in luxury within the finest ambience in Wayanad Nestled in the Sultan Bathery area, this is a beautiful serviced apartment/home stay option in Wayanad. The apartments have a modern and neat architecture, spacious and furnished interiors and balconies too. The apartments are only 2km from the Sultan Bathery Township and close to well-known waterfalls and sanctuaries. There is a wonderful children s play area too. The Edakal Caves are just 10km from the apartment and the Wayanad Wild life Sanctuary is 17km away. The Bandipur Tiger Reserve and the National park are 23km away. The Nilambur Railway Station in Kerala is 83km away and the Calicut International Airport is 107km away. Calicut, Mysore, and Bangalore are the nearest business destinations, 95, 117 and 317 km away. You can choose from a total of 12 apartments with a spacious hall, well-equipped kitchen, bathrooms, LED HD television, refrigerators, microwave and comfortable and clean linen. All rooms also come with a scenic private balcony, room service and laundry service. The apartment offers room service and complimentary breakfast every single day. You can also enjoy local Kerala cuisine from a lot of restaurants and eateries around Sultan Bathery. The apartment offers children s play area, ample parking space, and 24 hours help desk. Reason For Rating : The hotel details are not mentioned properly. The room had no AC and the property had no restaurant. Reason For Rating : Awesome place for a family outing. Reason For Rating : The place is very quite ans relaxing and the room very neat and clean. Reason For Rating : Good Ambiance, Clean and good condition rooms. Reason For Rating : Definitely a home away from home. They're s team of young graduates who are very hospitable. They gave us good suggestions to visit and also their food was amazing. Coming to the rooms it was amazing only con was the insects but you can't help if as there are plenty if trees and it rains. Overall loved my stay with them and was intrigued to extend my stay. What's Good: Its same as photos seen in website. Good for family stay. Clean rooms and good child play area. What needs to improve : We dont have breakfast options, has to go with menu decided by hotel. Though your staff is very good but they are reactive instead they should be proactive, I had to litteraly ask for cup, plates, spoons, gas connection for kitchen. Would be better if you keep those in place before guest arrives. Overall it's a good property with very clean swimming pool. I would recommend this property to everyone and also request staff to be proactive. its a great property with value for money. i had a great time and the staff were very welcoming. i liked the club house and the sitting area. the bed was very comfortable. the food was okie. its a proper apartment kind of a room. This is an ideal place for a family with a kid. It is small place , hence will not crowded and you can use the recreational facilities like swimming pool , foosball, Table tennis and small snooker table. Kids have a small playing area . We had a good time away from the noise and pollution of Bangalore . Breakfast is served to the room with fixed menu- Ok.
Bakwaas property. Avoid avoid avoid. No AC in all rooms which is not mentioned in website, no restaurant, no room service, in a remote location down hill a steep decline. The area is deserted and sad. The manager is stubborn, despite property being empty he did not upgrade us to a better room which had AC. Nice and cool place to spend quality time with your family. All the mentioned things are available. It's worth the cost we paid. All the tourist attractions are nearby. It's located in big town, so all shops are also nearby. Pls try Hotel Jubilee, one awesome place to have food in Sulthan Bathery. the room can be cleaned a bit more . Spacious and all the amenities are available.